Sgt. 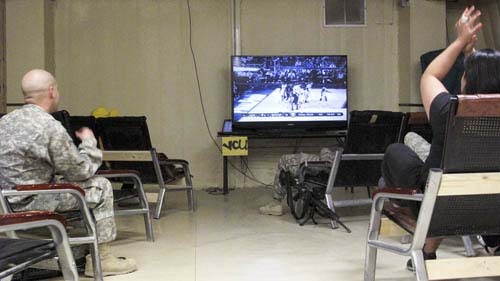 Dominic Lawrence, a Human Resources NCO from FOB Shank (left) and Frances Sanchez, a Field Rep for University of Maryland University College (right), react as Virginia Commonwealth University scores a basket in the first half of their Final Four game against Butler on April 3 at Forward Operating Base Sharana, Afghanistan. Frances, a VCU grad, set up a viewing party for anyone interested in watching. Turnout was low, which was understandable as watching the game live meant being up at 2:30 AM. Sadly for Frances, VCU’s Cinderella ride came to an end with their loss to Butler.